Ever since I was a little girl, I knew I wanted kids. For some reason, I knew I always wanted a boy, but as I had two girls first, I never thought I'd actually be a Mam to a little boy. So finding out that our third baby was a boy, was a huge shock. But it was amazing giving my two little girls a baby brother, and they absolutely adore him. He really did fill an empty space in our little family when he arrived. I was asked recently by KayaJewellery if I would be interested in reviewing some jewellery. I took a look at their website and instantly knew what I was interested in. I went for the Mother and Son Bracelet set. I have a few sentimental items for the girls and thought these bracelets would be perfect for Freddie and me, especially that his first birthday is coming up. 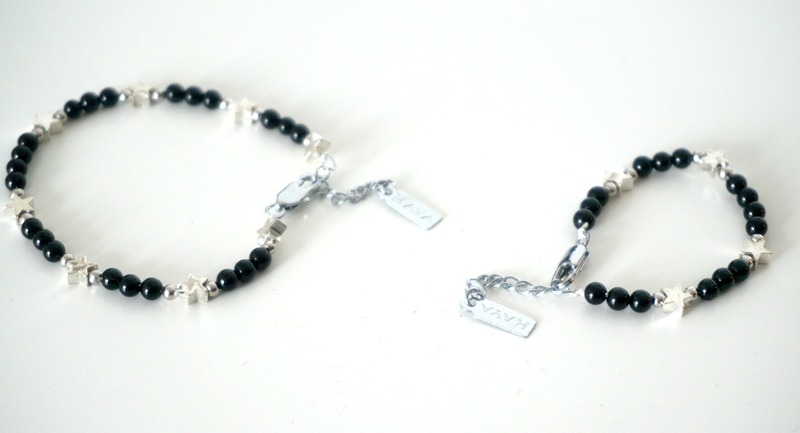 KayaJewellery offers many different bracelets for Mums and children. They're absolutely beautiful and reasonably priced. I was overly pleased with the bracelet Freddie, and I received. Their excellent quality and I know they are going to be treasured. I tried many of times to take a photo of Freddie wearing his bracelet, but as an active 11-month old baby who is absolutely everywhere, it was impossible. Although he won't be wearing his bracelet all the time like I do, it will go perfectly in his memory box, something I hope he will want to go through once he is older. Every bracelet is beautifully handmade. KayaJewellery would be a perfect gift for babies, Mums, and children for special occasions such as birthdays, new births and even Christenings. Most children want to be like their Mum, and these bracelets are such a lovely idea for every child and parent. A beautiful sentimental gift to keep and treasure. * We were given this product free of charge in return for an honest review. As always, all words, images, and opinions are entirely my own.